Presenter: We have our guest Fahri Al-Arashi, the Chief Editor of National Yemen Gazzette. Adnan Oktar: Welcome, it is so kind of you to be here. Fahri Al-Arashi: It is a pleasure of mine to be here. Since you have really contributed to my newspaper, I feel the pleasure to meet you and come to you. Adnan Oktar: We are brothers, no matter in which corner of the world we may be, we are brothers. Muslims are brothers; we will also be brothers in paradise and here, insha’Allah. Can you outline the situation in Yemen now, so that we can have a better understanding of the situation of our brothers there. Fahri Al-Arashi: Actually as you have seen it on TV or you may have read it online, there is a political uprising happening nowadays. Since I left the country last week there is an accelerating political uprisings happening. Yemen has been going through political transitions for the past two years but still Yemen is a fragile country in a polarized into the many different regional and international players who are playing politics and have their interest in Yemen. And what happened lately, mainly in the last week and the past two-three-four days is part of that because Yemen is a key strategical country and all the international players are trying and looking to control or have half a share or part over the country. Adnan Oktar: We see the manifestations of the End Times in Yemen. Every corner of the Islamic world is in devastation. There is also pain, suffering and afflictions in Yemen. This is the initial labor pain of a beautiful birth. In the near future, Yemen will attain a much better grandeur. Fahri Al-Arashi: I am very optimistic, thanks for his very gentle and optimistic words. As you said Yemen is one of the Arab Spring countries. Yemen has been a different example when it comes to the Arab Spring countries. As you know the Arab Spring countries has reached Libya, Syria, Egypt, Yemen and Tunisia. And Yemen is a different example of the Arab Spring, it is a peaceful example, but it is still, as I said before, a fragile country, Yemen is the only country that is controlled and supervised by the UN council, by the UN, by the G8 countries who are trying to safe Yemen because as I said Yemen is located in a very strategical location. Adnan Oktar: You are the sons of Vaysal Qarani. Surely we are going through a trial but with this beautiful spirituality, this beautiful faith, we will altogether attain a beautiful end. Adnan Oktar: As long as Muslims are brothers, as long as they are in contact with one another. As long as they work for the good of one another and consolidate their friendship. If the irreligious people see that Muslims protect one another all over the world, there is nothing they can do. Then the Islamic World will reveal itself as the greatest power. This will happen soon. Fahri Al-Arashi: This is the hope of everybody’. As you know, our grandfathers reached the far east, and they reached Spain, Andalusia. And that we would like to recall that history. You the Turks, as you were the Empire of Muslim countries you have reached Yemen, and that is how we came to know you. And you have reached the rest of the Arab country. So we are looking for the Muslim countries to retain back and enjoy its history. Adnan Oktar: Masha’Allah. Now the history repeats itself. The Islamic World will come together again. This does not come into being without any pain. We need to consolidate our brotherhood as much as possible. We need to reinforce our friendship as much as possible. This will be an auspicious act of worship that will please God. We are in the End Times, we are in a beautiful era. Fahri Al-Arashi: We are in a very challenging time. Fahri Al-Arashi: And we have to overcome those challenges. Adnan Oktar: Muslims are right now advocating the strongest idea of the world and they are in the most decisive era. All the ideologies have collapsed; fascism, communism, capitalism. All ideologies have collapsed, only Islam’s path is open. Fahri Al-Arashi: True, that is why we believe in the Kitab, the Qur’an, and we believe in the Prophet Mohammad (saas), which he has the Sunnah, and we believe in one Prophet, we believe in one God. Adnan Oktar: Yes, our Prophet (saas) had told all these incidents of the End Times down to their leanest details. And they all come true. This is a great miracle. Adnan Oktar: It is so fine that you are talking about peace, brotherhood, love. It is evident that you are on the path of our Prophet (saas), on the way of Hazrat Mahdi (as) as I am, that you are a follower of Prophet Jesus (as), and above all, that you are a follower of our Prophet (saas). Fahri Al-Arashi: Yes that is what we believe. We believe in all the prophets sent by Almighty God. We believe in all the nations and their prophets. We believe in Moses, Salih, Lot, Hud and Ishmael. All these prophets we believe in them. As a Muslim country this is like a clear message. We didnt have any problems nationwide. It is a matter of education and that is how we have been brought up into life, and that is how they have been educated, and it is our rule as Muslims and as Mr. Oktar is doing, it is just a matter of telling the truth. If we didnt do that, then we committing worse mistakes than them. Adnan Oktar: Insha’Allah. May God add to your holy light. May God make us see the reign of Islam. May God make both you and me the followers of Hazrat Mahdi (as). May God make me, you and all Muslims the followers of Prophet Jesus (as). May Almighty God make us truly comply with the Qur'an. May God make us be the followers of our Prophet (saas) in the true sense of the word. We know that those good days are close at hand. Insha’Allah may God lengthen our lives, so that we can see those days. Fahri Al-Arashi: This is the part of Muslim community because we are unique, waiting for that day. Even in our bad times, even if we commit an sin, even if we make mistakes, we still regret, and Almighty God accepts those regrets for us because we believe in our religion, so we do that. Adnan Oktar: Masha’Allah. Insha’Allah we will meet again. For today let’s end our broadcast. May God make us convene around the tables of paradise and see each other like this. Presenter: We will give a short break. We thank Mr. Al-Arashi for being with us. 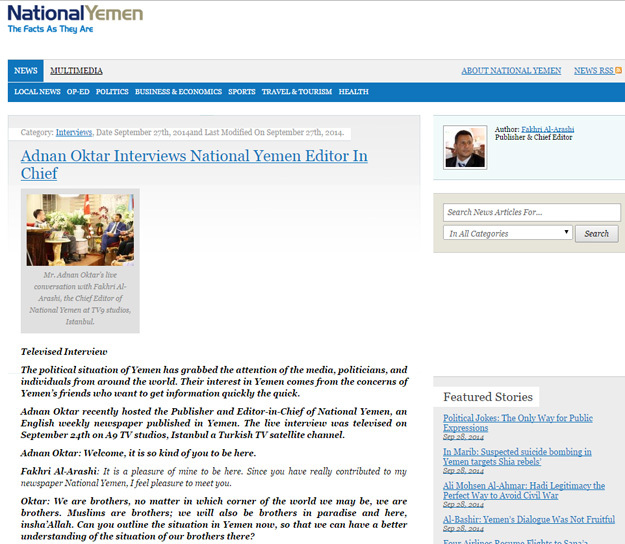 He is the Chief Editor of National Yemen Gazzette.